Best sellers, beach reads, pulp fiction, dime novels, must reads, penny dreadfuls, by whatever sometimes fanciful name we call them, mass-market paperbacks have been around since the 1930s or so. Handy to carry (they were called pocket books early on, and would actually fit in your pocket) and available in drugstores, newsstands, and that now quaint institution the brick and mortar book store, early paperbacks were a combination of classic re-prints, adventure stories and whodunits. It seems that everyone has their favorite escapist genre – hard-boiled mysteries, historical fiction, paranormal romance, science fiction, spy thrillers, or any combination of the above — teenage post-apocalyptic romance/horror/fantasy. Remember S. R. Ranganathan’s Third Law of Library Science – “Every books its reader”. Even if some NYT best-sellers might not appeal to us personally, studies have shown that fiction readers are more empathetic and have increased brain activity (see http://online.liebertpub.com/doi/pdf/10.1089/brain.2013.0166). So, don’t feel guilty about reading as a guilty pleasure! No escapist genre is as American as the Western adventure story. 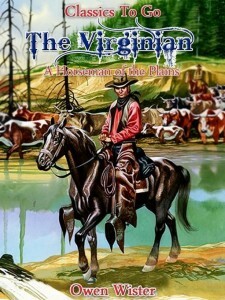 There were western adventures in serial publications and dime store novels, but it all began in earnest in 1902, with the publication of The Virginian, when author Owen Wister planted the seed for a new genre of fiction set in the Wild West, replete with the romance of a mysterious tenderfoot stranger and a schoolmarm. The novel has been made into several films, and a 1960s television series, and is still in print from Simon & Schuster. Other writers soon followed, including sometime New Mexican Eugene Manlove Rhodes, who lived in southern New Mexico and set several of his stories there. W.H. Hutchinson called the writings of Rhodes “stories of virgins, villains and varmints”, and that just about sums them (and perhaps all Westerns) up. Rhodes spent most of his life away from New Mexico, mostly in New York and later in California, but he loved the New Mexico landscape and would describe it almost with a photographic memory. Homesickness and longing for New Mexico may have influenced his romanticized view of the West in his writings. He published nearly a dozen novels, many of which first appeared in serialized periodicals. The Best Novels and Stories of Eugene Manlove Rhodes (U of Nebraska Press, 3rd. ed. 1991) includes his classic Pasó por aquí. Zane Grey, an Easterner, avid sportsman, fisherman and world traveler who later moved to California, was another early author of Westerns, which were mostly mythologized renderings of the Old West. His books were not a hit with critics, but he was one of the most successful early Western writers and his works were adapted into film and later television. 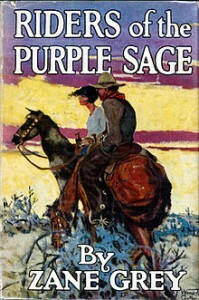 Riders of the Purple Sage, first published in 1912 but set in 1871, was his best-selling novel, set in Utah. It established the formula for the modern day Western novel – the mysterious stranger in black, cattle rustlers, a virtuous damsel in distress (and Mormon polygamists for added measure). There are several film versions of this classic which is still in print from Pinnacle Books. Famous contemporary Western writers like Larry McMurtry, Max Brand, Cormac McCarthy, Louis L ’Amour and Max Evans will satisfy the modern reader with a yen for a good western adventure to pass the time, and are readily available in local libraries and bookstores, in paperback as well as e-book versions. If your patrons want to try out less well-known and emerging Western authors, check out the Western Writers of America web site (http://westernwriters.org/) which has an online catalog of members’ books for sale, and a list of their annual Spur award winners. Do you have an iPhone? Do you use these apps?